“The government’s response to hunger is violence,” said Zeph Repollo, Southeast Asia campaign coordinator for 350.org, in an email to Common Dreams. Three protesters were immediately killed, and by Monday the death toll had risen to 10 as more demonstrators succumbed to injuries. The farmers and Indigenous people had been blockading a highway in the Cotabato province for four days in a desperate plea for government aid, after this winter’s record-breaking temperatures produced a three-months-long drought that has destroyed their crops and now threatens their lives. The demonstrators were asking the government to provide 15,000 sacks of rice to ease the hunger crisis. Provincial governor Emmylou Mendoza has refused to engage the protesters. 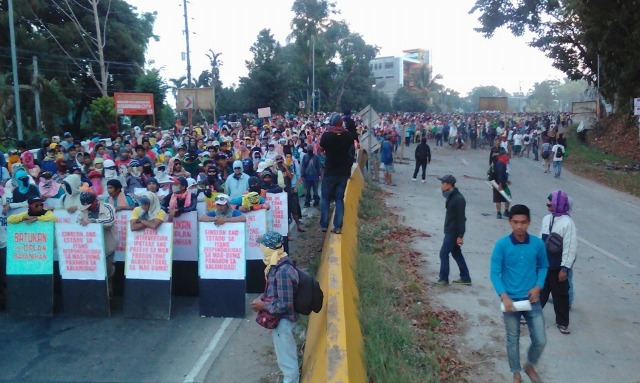 “The government’s policy of systematic land grabbing combined with the intensified El Nino pushed our farmers and indigenous peoples to heighten their struggles with sweat and blood in defense of their right to land and life,” wrote Repollo in a statement. Seventy-eight people were still under arrest on Monday, Rapollo said, and a local Methodist Church is sheltering many protesters who escaped the bullets. Rapollo also reported that no members of the armed forces have been relieved of duty or investigated for Friday’s shooting. The state-sponsored violence in the Philippines portends what turmoil may come as the planet continues to warm, creating more disastrous, extreme weather events worldwide, environmental activists note. “The conditions that prompted the 3-day blockade gives us a glimpse of what’s ahead if decisive and just actions in addressing climate change remain in the periphery,” said Repollo.